Circle..S47..8-10mm New! Circle..133..8-10mm New! Circle..S17..6-7mm New! Circle..S21..8-10mm New! Circle..041..8-10mm New! Circle..Z28..8-10mm Back in stock! White/black. Also available in size 6-7mm. Yellow/white/red/yellow. Also available in size 6-7mm. We had to wait a long time to finally get more inventory of this very popular purple/periwinkle/white,dark cobalt center pattern. Circle..S79..7-10mm NEW! Circle..U60...6-7mm...New size! Circle..S62..7-8mm New! Transparent purple/cobalt/clear. Also available in size 8-10mm. Green/transparent. Also available in size 6-7mm. Circle..S72..5-6mm..NEW! Circle..81..7-8mm New Size! Circle..T19..6-7mm New! Circle..S99..7-12mm New! 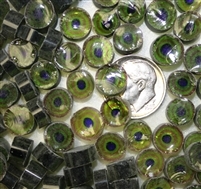 Assorted Circles Circle..V82..6-7mm New! Circle..Z28..5-6mm New size! Circle..U51..8-10mm New! Circle..113..8-10mm Back in Stock! Periwinkle/white,dark cobalt center pattern. Also available in size 8-10mm. Black/orange/yellow/red. Might be a little dusty in bag, will shine if rinsed. Red/black/yellow/red. Also available in size 7-8mm. Almost out ~ Chocolate/white/dark dark cobalt center (looks black). All of our millefiori is coe 104 unless noted. These arrived a little dusty so I rinsed them before taking picture.